Did you ever notice how seldom I share classics actually found curbside? I’m forever finding old cars and trucks in parking lots. It’s because I live more or less in suburbs. It’s all cul-de-sac neighborhoods and strip malls out here. Three-car garages are the norm; who parks on the street? So when I find a classic, it’s usually in a parking lot. But so seldom do I find such an odd juxtaposition as between a Bed, Bath, and Beyond and a rustbucket 38-year-old Ford F-250. Not the kind of vehicle you’d expect to find in a suburban strip mall, even in Indiana. This is the angle at which I met this truck, actually. I’m partial to the 1978 and 1979 F-series trucks because my grandpa owned one, a ’78. His was a Ranger, the trim level above the entry-level Custom. Above Grandpa’s truck sat the Ranger XLT and then the Lariat, with increasing levels of what passed for truck luxury then. Curiously, in ’78, Customs got round headlights; the upper trim levels all got rectangular headlights. In ’79, it was rectangles for all Ford trucks. From a distance, I figured this plain white truck had to be a Custom, and so its rectangular headlights pegged it as a ’79. 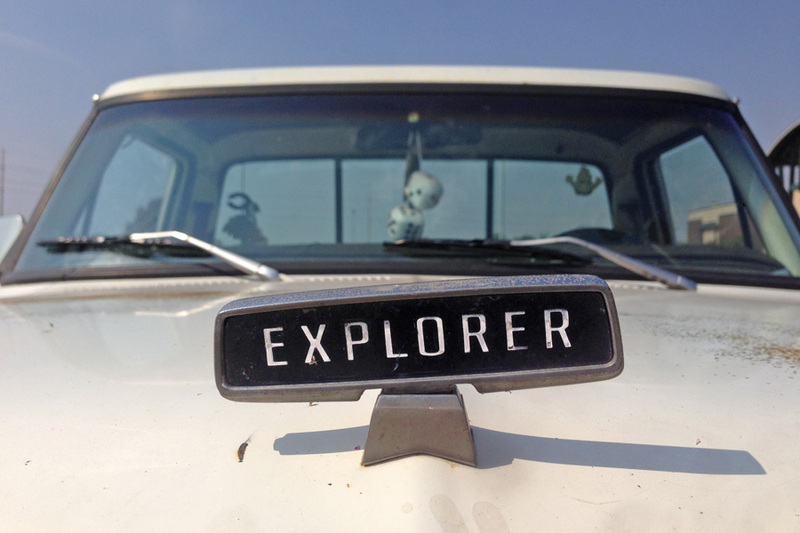 But then I spied this detail: an Explorer hood ornament. Ooh! The plot thickens. For those of you who grew up in the 90s or after, this is an Explorer. It was certainly not the first modern SUV, but from where I sit it was the first one aimed at middle America and as such it became wildly popular. I remember idly watching TV with my girlfriend in 1990 and seeing our first ad for the new Explorer. We weren’t truck or SUV people, but we agreed: it was an enormously attractive package and we’d consider owning one. Then it seemed like the whole gol-danged universe bought them, and being the type who assiduously avoided jumping on bandwagons we banished the idea, never to mention it again. But even I knew then that Ford had recycled the Explorer name from its full-sized trucks. It was an old Ford trick: they had done the same in naming the compact Ranger in 1983. And why not use a name that already has some equity, some familiarity? Ranger had a clear place in the Ford truck trim hierarchy: Custom, Ranger, Ranger XLT, and Lariat. At least that’s how it went through most of the 1970s. But Explorer was different. 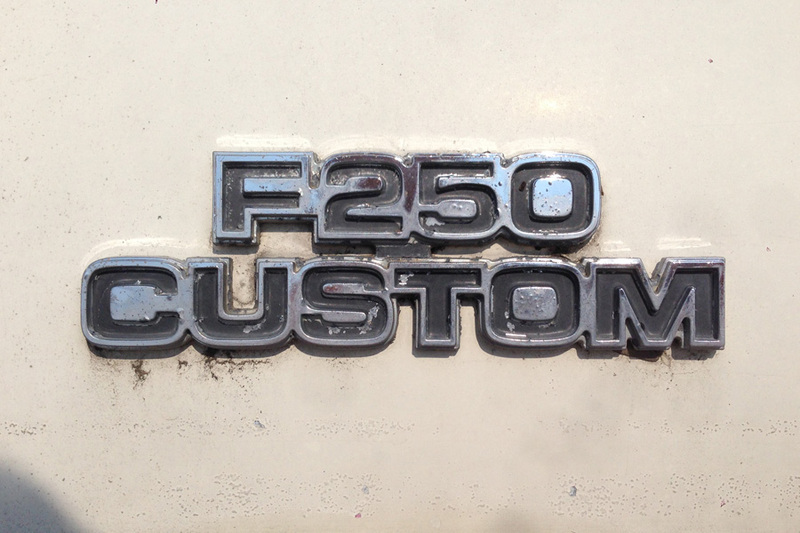 It was an annual limited-time trim-and-options package that could be added to the F-150 or F-250 Custom or Ranger. A lot of what you got amounted to special paint colors, tape stripes, extra brightwork, carpeted floors, and patterned seat inserts. But you could also “package up” into power steering and an automatic transmission, and even air conditioning and tinted glass. Available colors varied from year to year. In the early years, you could get the Grabber paints a la Mustang and Maverick. In later years the colors tended toward rich metallic hues like Dark Jade or Mexicali Red. But obviously, in 1979 Ford offered the Explorer package in good old Wimbledon White, and without tape stripes to boot. A strippo Explorer? At least this one got the plaid seat inserts. And the automatic transmission, meaning that it got at least the “B” package. Not so strippo after all. Might have started life as a commercial delivery truck. Common to see fancy interiors, lots of convenience options, and plain exteriors in that usage. Keep the driver happy, convince the customers that you’re “efficient”. I’ve owned three commercially equipped trucks. In my experience, usually the company went as cheap as possible. My two commercially-owned-when-new pickups are a 1987 Chevrolet Custom Deluxe R10, and a 1986 Dodge Ram D250 custom. Both had no floor mats, no headliners, AM only radios, and no in-dash air vents (Floor or Defrost only). The other truck was a 1997 E350 box van- that one was also just the basic XL package. Why spend money on delivery trucks? It’s not like they have to drive it! I love the “honk if parts fall off” bumper sticker – one has to have a sense of humor about a vehicle like this. There are not too many of these still in daily service in the Carolinas. For whatever reason the GM trucks of the period are more popular with the guys who will spend the money jazzing them up and keeping them going, albeit more as customized rigs. Old Fords like this are more likely to be seen in stock condition with the patina of all those years. I’m guessing the Fords were bought more for work and were just used up. I’m not a truck guy, but I respect an honest vehicle like this. You must be in a different part of the Carolinas than I was. I lived in Raleigh for 9 years and Durham for 3, and 70’s Fords were *everywhere*, especially in Durham. Seems like I’d see several per week. Pretty common up here in Richmond, too, much more so than Chevy in both cases. It seems like I saw more 70’s Chevy trucks than Fords in the 80’s and 90’s, but sometime in the past 10 years or so the situation has changed. I’m thinking that the Fords must have been more rust resistant; even though rust wasn’t a huge problem in NC, Chevys with the cab corners or rear wheelwells rusted through became a common sight. I’ll bet this truck belongs to a BB&B employee, probably at the lowest rung on the employment ladder. From a time when Ford still (usually) meant F 100. I can relate to finding mostly “parkinglot classics”. This owner must have been looking for the “beyond” in Bed, Bath & Beyond. Ford also used the Expedition name as a trim on the 2-door Explorers right before they came out with the Ford Expedition. What a terrific old 3/4 ton! Makes me miss my old ’87 Dodge 3/4 ton. This pickup intrigues me. For it being a 3/4 ton, it appears to not be equipped with the larger rear hubs that would necessitate rear wheel covers that stick out further. As such, could this likely be one of Ford’s lighter duty 3/4 tons? I’ve seen numerous examples of such from the late ’80s and early ’90s, but none of this age. Hmmm. The brochure attachment shows two distinctly different GVW’s for the F-250, which goes along with my theory. Also, a lot of the lighter duty 3/4 ton’s I’ve seen have been powered by the 300 straight six. While I don’t have any love for that engine, there are obviously lots who do. Terrific find Jim, especially in your crispy climate! See my lower comment about light vs. heavy-duty 3/4 tons. All F-250s had full floating axles with the larger hubs, but they probably fit under those hub caps. The F-100 and F-150s used the Ford 9″ rear end, which of course was a semi floating rear end. Most people used to call the F-150′ “heavy-half tons” or light 3/4 tons. This would have a Dana 60 rear axle that doesn’t require the extra deep hub caps that would be the Dana 70 found on the SRW F350s. As noted below it wasn’t until a little later that they came out with the light duty F250 and E250 that had 8 lug wheels but a semi-floating rear axle instead of the industry standard full-floating Dana 60. 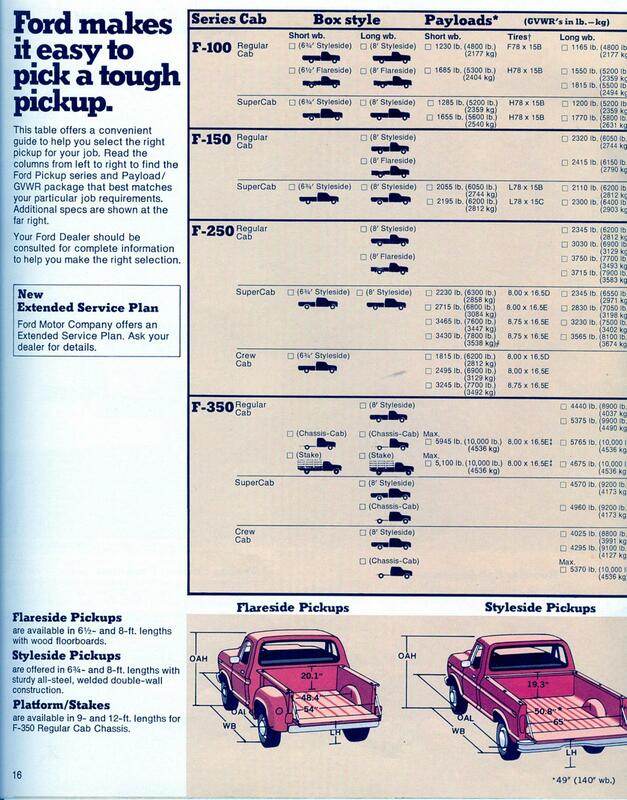 According to my info (from Ford literature), the F-250 had a Dana model 60 2-pinion full floater (4×2, 4×4). A Dana model 61-2 was used on F-250’s and F-350’s with the 460. This was basically the same as a 60, but a heavier design. While F-350’s got the 4-pinion Dana model 70 for limited slip applications. So this truck (if equipped with an original rear axle) would have a full floater as stated above. And as Eric stated, the Dana 60 didn’t require the extra deep hubs. Also note that some F-100 and F-150’s did use a Dana model 44-3 rear axle. That how ford got the explorer name back in the day cool. It’s not just name equity, it is a trademark issue as well as a branding issue. Ford was interested in naming its vehicles a certain way – Explorer, Edge, Expedition; Focus, Five Hundred, Fusion, Fiesta. So the Explorer name was recycled that way. 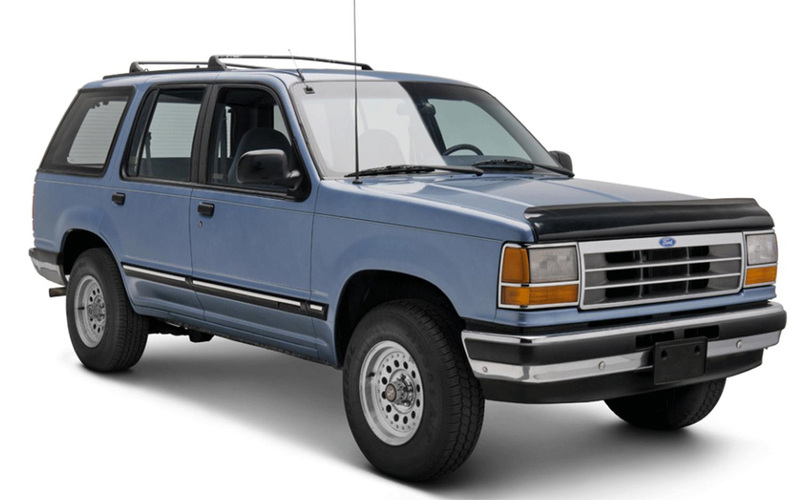 It could have easily been the Bronco III, but also by keeping the Explorer name in the present use, Ford could maintain the trademark. Recall that the Fusion was introduced as the Futura, but Ford had discontinued use of the name (last used on a Fairmont model I believe) and Pep Boys scooped it up for a tire brand. Rather than pay a royalty, they changed the name. When I see this truck, I think Uncle Jesse. Ford deliberately left the Bronco II moniker because 1. they wanted to avoid any negative associations with the seemingly rollover-happy mini-SUV, and 2. By 1991, higher-ups had more than a feeling the full-size Bronco would get replaced by a four-door model before the decade was up, and didn’t want to “orphan” their compact SUV. But that could all be hearsay, I dunno. That and the fact Ford was missing out on sales to the Jeep Cherokee due to the fact it offered a 4 door model. GM did the same thing with its compact Blazer/Jimmy duo but unlike the Blazer and Jimmy which could be slightly modified for 4 doors, the Bronco II could not be modified easy so it was killed off in 1990 with the Explorer arriving as a early 1991 model in 1990. I always wondered if the infamous OJ Simpson Bronco slowspeed chase didn’t factor into their decision to drop the name. But maybe “Bronco” just sounded too wild for a grocery-getter vehicle. Unbelievable! I haven’t seen a Ford truck of this vintage in a very long time. I always liked the style, but the one thing about these that always bugged me: most of the Fords I saw had a subtle sag to them – the bed and the front half never seemed to line up, either the frames bent easily or something, but it appeared to be native to these. For some good reason, this truck lines up like new! I think the sag problem was due to cab mounts that softened due to rust. The worst of them seemed to make the front fenders and hood point towards the sky. 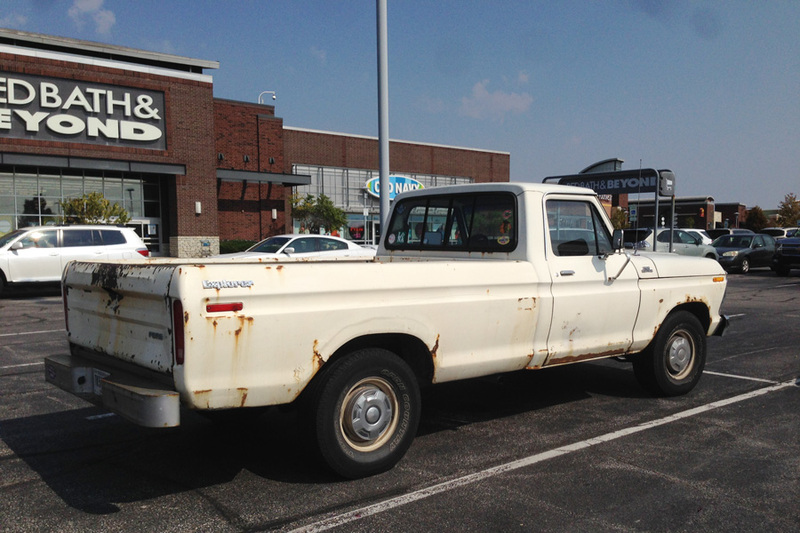 Reverse CC effect – I saw one (F-100 Ranger, non-Explorer) on the road last Tuesday! A nice old rig . I had a ’79 F150 as a Shop Truck for a while , pulled it out of Salvage and cleaned it up , tuned it blah blah blah , it had a 302 with ” heavy duty cooling ” meaning the 351 radiator , it was a sturdy if basic rig . Nice to see one left . IIRC , the ‘ light duty ‘ 3/4 ton rigs were a smog dodge , at least here in California they were ~ by adding slightly heavier springs and so bumping up the GVW , the emissions test numbers were reduced a fairly good bit . This of course sold lots more V-8 equipped Ford trucks back then . The F-150 “heavy half” was a smog dodge. Different payload packages had always existed for the 3/4-tons, but it wasn’t until 1983 with the introduction of the diesel that an actual mechanical distinction was made between the light-duty and heavy-duty 3/4-ton. The light duty came with the 300, 302, or 351, and the HD with 300, 6.9 diesel, or 460. I tried to find a chart from the ’83 brochure or something but I couldn’t. The F-100 was limited to the 300, 302, and 351. However, the F-150 could be equipped with the 300, 302,351,400 or 460. 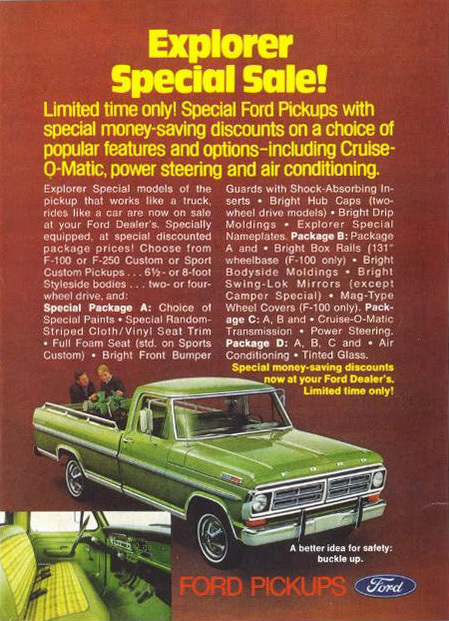 For this 6th-gen model, yes (and the ’77 brochure I’m looking at also says you could get an F-100 with a 400). I was talking about the post-83 7th-gens. If I was at home I would scan in and post a chart out of the ’83 brochure. Is there anyone here who had (or even remembers) an F-100 with the 255 Windsor or the 3.8 Essex that replaced it? My high school math teacher had an F-100 with the 3.8. He was still driving it – and it still looked great – in 1990 when I left. 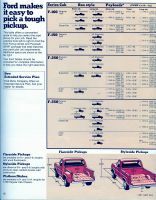 Since this article is about a 1979 Ford truck, my engine list was for a 1979, where you couldn’t get anything bigger than a 351 in a F-100. I do remember the final year or two of the F100 that first had the 255 and then the 3.8. The other interesting thing about those last of the F100s were that they did not have the 5 x 5.5″ wheel pattern that Ford used on their 1/2 ton trucks and vans until the 1997. Instead they used the 5 x 4.5″ pattern shared with the Panthers, Mustangs and mid size cars from the 70’s and earlier though they did not share the rotors with any other Ford vehicle. My first thought was Uncle Jesse. Of course, his had the earlier grille (but the lead pic is a rear 3/4 view). Oh yeah! Thanks for bringing back that visual. 1978-79 Ford trucks have that look about them, don’t they? They fit the with the whole “built Ford tough” scheme and I have to say that these make rather handsome rides when restored, not with over the top additions, but a catchy coat of paint and nice rims & tires. I still see these around on occasion in these parts, not in huge quantities, but they are still hauling tools, equipment, yard waste, etc. As long as it’s mechanically maintained a truck always serves a purpose. My brother in law had a 4WD version that he used on his farm. He liked to play in mud bogs back then, and swapped a premium-gas 460 into it from a deteriorated 1970 Lincoln that he bought cheaply. He always said that Chevy trucks were better for driving, but that the Fords were better for working. This would probably be in line with haroldingpatrick’s observation above. When these were new, I was struck by how un-truck-like the dash looked in these. Ford did a very credible job of making the interior both car-like and very durable at the same time. I think these Ford interiors held up better than either the Chevys or Dodges of the same era. The Chevy is a vehicle, the Ford is an implement. Not in a pejorative way. One of my high school friend’s father had a slightly earlier version of this – a 76? It carried our gear to a lot of great Boy Scout camping trips. As we got older, he had some, um, adventures in it which I fortunately (or maybe unfortunately) I wasn’t involved in. Ahh, the difference between the left coast and the heartland. Trucks of this era are still very common out here in coastal central California. Often looking just as rusty, though from salt fog and being loaded with dripping surfboards. In fact, during the recent thread on the age of the VW Beetle platform, I thought that perhaps there are probably as many ’50’s and ’60’s non-IFS leaf 2wd pickups around here, with essentially a 1930’s architecture, as there are Beetles or Type II busses. Perhaps more actually, compared to pre-Super Beetle VW’s with the torsion bar and trailing arm front end. What I remember is there was a distinct difference in truck preferences as you traveled south from the dakotas down to texas. For instance, in IA, NE, and the dakotas, trucks tended to be 4wd automatics unless driven by old men then they were often 2wd trucks with home made wooden sideboards added(especially in IA). But as you traveled south to OK and into northern TX there was a shift in truck preferences. They became 2wd stickshifts with flat beds and duallies. The square headlights perfectly complement the hexagonal grill. My father drove a ’75 F250 Ranger XLT for most of my childhood, from around the time I was 3 up until I turned 16 in 2011. 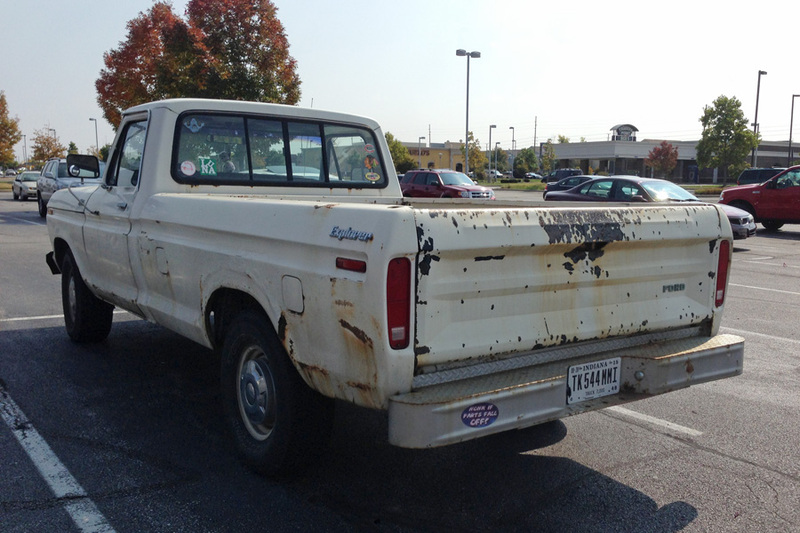 The truck was badly rotten out by the time he sold it, as benefits an old, daily driven Ford in Ohio. It was a very cool truck, with a cammed 390, 4 pot carb, and dual cherry bomber glass packs. I thought for sure it would become mine, dispite its rust issues and blown manifold gasket. Alas, the ignition was worn, causing me trouble when attempting to start it, to the point where in a bout of teenage rage I claimed I hated it. The next week I went off to camp, and when I came home, an add had been run in the paper. It sold for $300 by the end of the day. I haven’t let my father out of my sight since!! For whatever reason these late 1970’s Ford trucks have survived very well in this area. They are much more common than the early 1980’s models. They also seemed to hold up much better than the GM’s and Dodges of this era. These trucks are still popular in this area as 4×4 mud trucks. There are actually a few reg cab 2WD trucks that are just driven as daily working drivers. Ford seemed to have drastically improve their rust resistance in the late 1970’s and maybe that’s why there seems to be far more 1978-79 Fords than the 1973-77 models that survived. However, that is purely anecdotal. 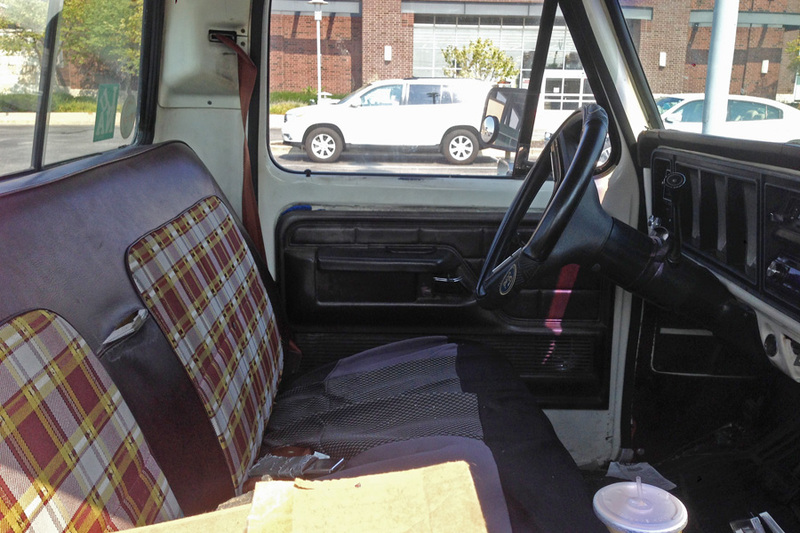 I have fond memories of my father’s old 1979 F-150 2WD reg cab 8′ box with a 460. Great looking, fast and tough old truck, even tough my father cursed it’s atrocious fuel mileage. A friend of mine has similar fond memories of his uncles old 78 Ford truck and he has bought a few of these over the last five years (but he constantly flips cars). 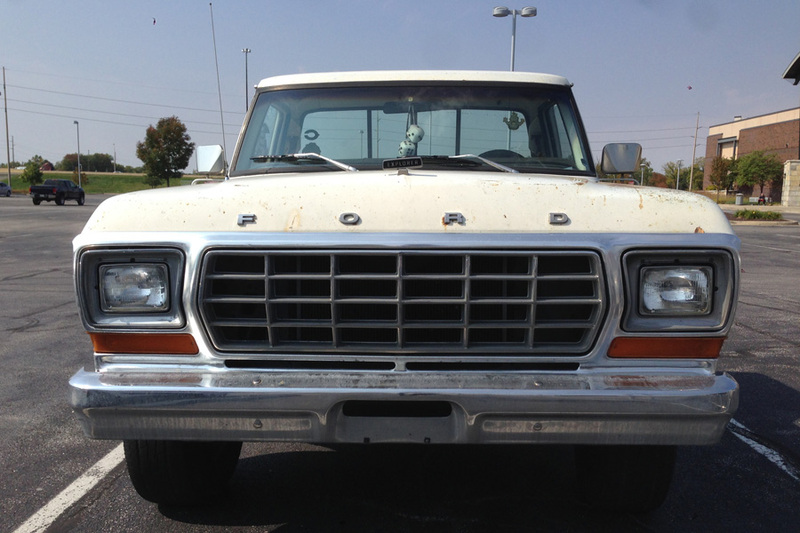 His current one is a 1978 F-250 with a 300 six and a 4 speed, which he’ll probably sell this year. I wasn’t aware you could delete the Explorer stripes, could this truck simply have been repainted, say 20 years ago? 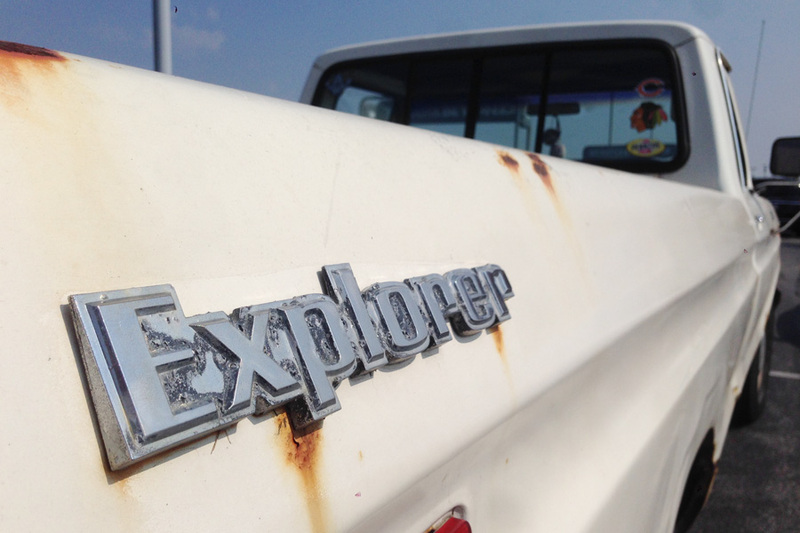 As a kid in the 70s, I was able to identify the year of an Explorer’ed truck by the stripes, as they changed annually.. The dog dishes are another oddity on this one. 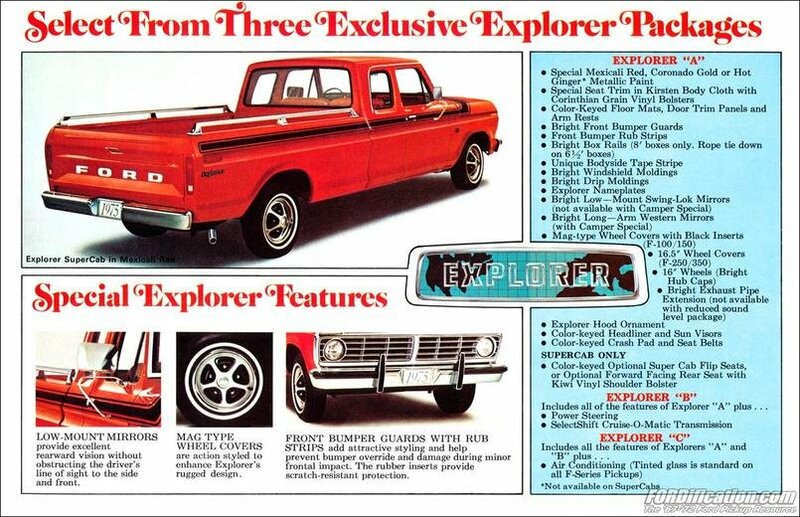 The Explorer package typically included some sort of full wheel covers. Then again it is an F-250. 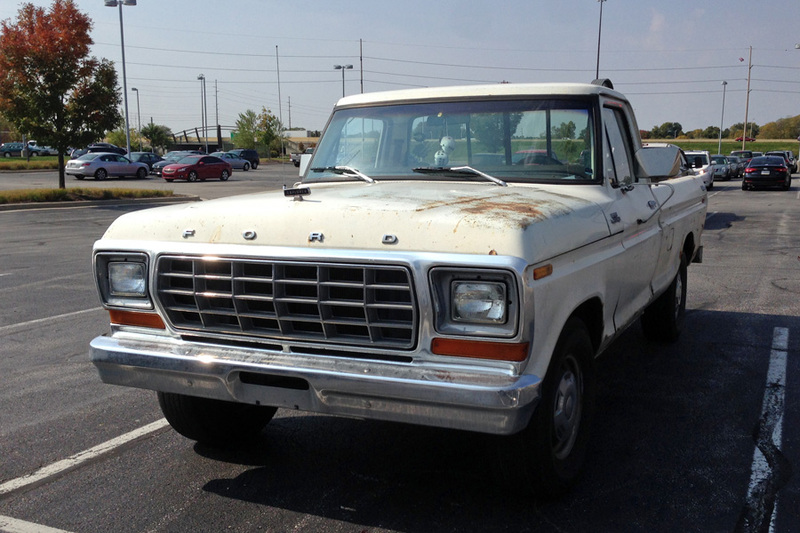 A neighbor of ours had a ’78 F100 when I was a kid, reminiscent of this one except for the short bed and round lamps. It had also had the hubcaps deleted, steel wheel faces painted gloss black, and all-terrain tires (though it wasn’t lifted). Bright fire engine red, and a V8 of some kind, though I never asked which one. Always thought it was a cool truck. They moved away in 1990, but my Mom reunited with the family much later, and we visited them about 6 years ago. Mark still had that old F-100 at the time, though it was looking rather worse for the wear, with the formerly shiny paint faded, chalky, and spotted with primer. He eventually sold it when they moved to Georgia; wonder if it’s still out there on the road like this featured truck is?